The state’s most popular species for recreation fishermen, summer flounder, also known as fluke, could see its quota cut by as much as 50 percent this summer under a federal rule that is currently pending. 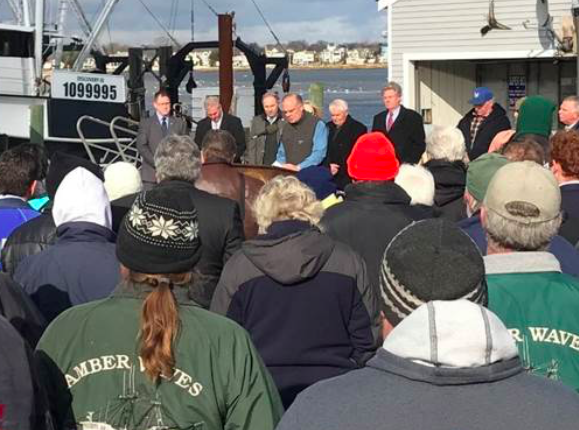 The rally followed votes last month by the Atlantic States Marine Fisheries Commission (ASMFC) and the Mid-Atlantic Fishery Management Council (MAFMC) that would likely result in drastic increases the the minimum size of a legal fish and a sharp cut to the length of open season. Though summer flounder fishery stocks have grown over the past decade to near-record levels, some fisheries managers and those in the environmentalist community have still suggested cutbacks because of what they believe is a lack of future growth and “recruitment” in the species. Fishing advocates and some scientists have countered that the methodology used to collect the data on the fishery is incorrect and needs to be replaced. Fishery managers use a combination of individual fish length, daily catch limits, and season length adjustments to achieve harvest reduction targets, or quotas. Martin said that past management of quotas for recreational and commercial fishing industries have been much too capricious, varying widely from year to year and leading to great uncertainty in both industries, as well as competitive disadvantages to New Jersey. Martin recently submitted comments to the ASMFC formally opposing the changes, he said. Other options the ASFMC is considering range from reductions of 28 percent to 41 percent in flounder quota. Any reduction for 2017 would be on top of a 27 percent reduction New Jersey has had to implement after successfully fighting off a proposed 59 percent reduction in 2015. A decision to cut fluke quotas could decimate the Shore economy, Martin said. “Coming to the Jersey shore to fish for fluke is a time-honored tradition that would be placed at great risk if anglers and their families felt that there would be no point in making the trip,” he said. Recreational fishing in New Jersey directly creates about 20,000 jobs and contributes $1.5 billion to the state’s economy, with commercial fishing generating another billion dollars in economic benefits, state data shows. The DEP is particularly concerned about any regulatory changes that would increase the minimum length of fish caught in New Jersey because few fish would meet the larger size limit. Lawmakers at Friday’s press conference included U.S. Rep. Frank Pallone and state Assemblyman Dave Rible. The ASMFC is meeting between Jan. 30 and Feb. 2 to discuss and potentially vote on final plans for the fishery. After a plan is adopted, states will then be tasked with implementing the federal quota through their own regulations on size, season and bag limits.